Kuhn was raised in Brooklyn and received little formal artistic training before relocating to San Francisco about 1899 to work as a cartoonist for the weekly The Wasp. From 1901 to 1903 he studied painting in Paris and Munich. Back in New York in 1903 he worked again as a cartoonist and in 1908 he joined the faculty of the New York School of Art. His oil paintings progressed from the dark tonalism of the Munich School to impressionist landscapes; by 1909 he knew the art of Paul Cézanne and began to experiment with Post-Impressionism. After the Armory Show, Kuhn continued to explore Fauvism and post-Impressionism in his work. But he never fully understood or appreciated non-representational art and avant-garde styles, and he remained committed to expressive realism. His account of the planning of the exhibition, The Story of the Armory Show, published in 1938, was the primary source of information about the exhibition for many decades, and was a key source for Milton Brown’s classic book of the same title. The Pastellists was an organization of artists that formed in New York in 1910 for the purpose of exhibiting artwork produced in the medium of pastel. The group helped organize four exhibitions in New York between 1910 and 1914 before disbanding in 1915. Other members included Leon Dabo, Elmer Livingston MacRae, Jerome Myers, Everett Shinn, and Juliet Thompson. The Madison Gallery group included Kuhn, Myers, MacRae, and Henry Fitch Taylor, who met regularly at the Madison Gallery to discuss how to promote the work of young artists and what they identified as progressive art. For Kuhn’s role in planning the Armory Show, see Gail Stavitsky, “Walt Kuhn: Armory Showman” in The Armory Show at 100 (New York: New-York Historical Society, 2013). 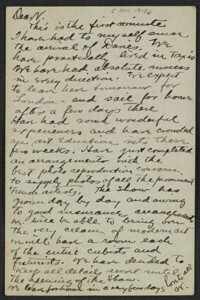 Walt Kuhn to Vera Kuhn, November 11, 1912, Walt Kuhn Papers, Archives of American Art, Smithsonian Institution, microfilm reel D240, frame 450-451.